Local Cremation’s Arlington, Texas location celebrated with a Ribbon Cutting ceremony on October 6. 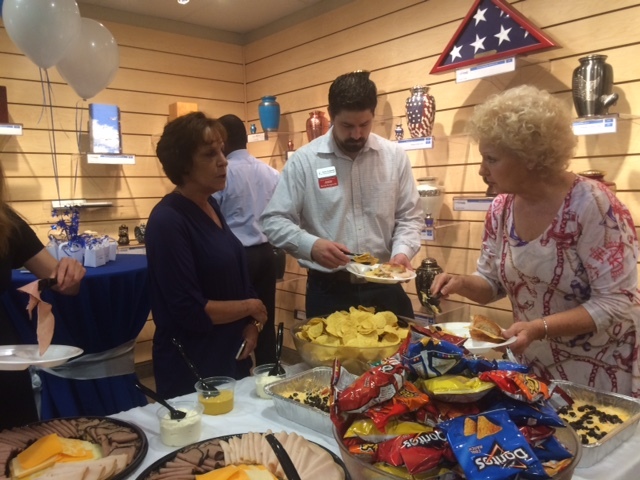 The well attended event included a representative from Tony Tinderholt, House District 94, Gina Woodlee, Director of Membership Development for the Arlington Chamber of Commerce, and numerous other Chamber members and guests. The office space at Local Cremation is designed so families can come into our office and know they are going to receive the highest quality of care without having to pay for the expensive real estate and amenities of a traditional funeral home. Because we own our crematory, the families we serve find great comfort in knowing their loved one never leaves our care. When you visit Local Cremation in Arlington, you will see comfortable sitting areas and private area where families can make arrangements for their loved ones. We have a full selection of decorative urns families can see in-person, if they are choosing cremation, or they can select from a full range of affordable caskets if they are planning a funeral or graveside service. The other thing families appreciate is our convenient location, on Pioneer Parkway between Bowen Road and Fielder Road. If for some reason, a family is unable to come to our location (or our locations in Dallas or Lewisville), we can meet them in their home or at a nursing facility. We are here to provide in-person service to the Arlington area as well as the Greater Dallas-Fort Worth (DFW) Metroplex. Local Cremation is a Texas licensed Funeral Establishment. With locations in Dallas, Arlington, and Lewisville, the company provides in-person affordable cremation and funeral services throughout the Dallas-Fort Worth Metroplex, Arlington and Lewisville. Local Cremation’s services include simple cremations (also called a basic cremation), memorial services, funeral service at local churches, graveside services and Veteran memorials. Contact us at 214-343-4040 to talk with a Funeral Director or set up an appointment at any of our locations.